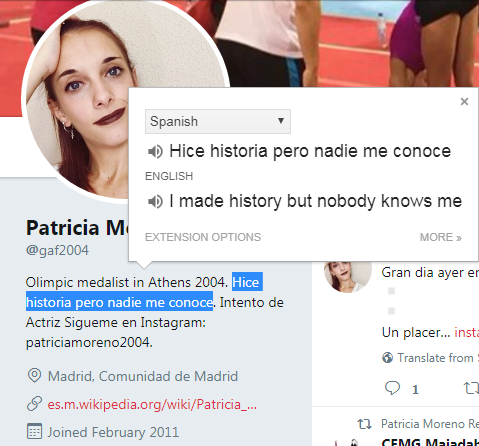 "I made history but no one knows me" writes Spanish gymnast Patricia Moreno in her Instagram and Twitter bio. This beautiful former athlete, whom everybody should know, is one of the best gymnasts Spain has ever produced. Moreno was born in 1988 and at the 2003 World championships, which was her first ever major international event at senior level, she helped her team finish in fifth place in the final. By qualifying to the pre Olympic Worlds team final, the Spanish team secured a trip to the Olympics in Athens. This was the last time Spain sent a full team in women's artistic gymnastics to the Olympics. At 2008 Beijing, they were represented by Laura Campos and At 2012 London Olympics, they had no representative individually or team wise. In Rio, Spain made an appearance after 8 years of Olympic absence when Ana Perez earned an individual spot through test events. There, Perez finished thirty-sixth in the preliminary phase of the competition. Moreno was named to the 2004 Olympic team where they finished in fifth place. At that time, all the eyes were on her teammate Elena Gomez who became the first Spanish female artistic gymnast to win a World title two years earlier. The gold came on floor exercise. Gomez continued her success the following year by winning bronze on the same event at Worlds. The World champion was a strong contender on floor in Athens but finished in 10th place in the qualification thus missing out on final spot. Moreno, the then little unknown gymnast, debuted the difficult three and half twisting back layout which now bears her name in the CoP and is rated an F.
She went on to perform a solid routine in floor exercise final which earned her Spain's first Olympic medal in women's artistic gymnastics. She claimed bronze behind Romanian champions Catalina Ponor and Daniela Șofronie. The Olympic medalist continued competing after Athens. She was part of the 2006 World Spanish team who finished in 8th place in the final. This was the last time for Spain to qualify to the team final at a World championships. A knee injury forced her to retire in 2008. She now works as a coach in her home country. First female artistic Spanish gymnast to win an Olympic medal. Originator of the super difficult triple twist and half back layout that carries an F rating. Member of the last Spanish Olympic team in women's artistic gymnastics. 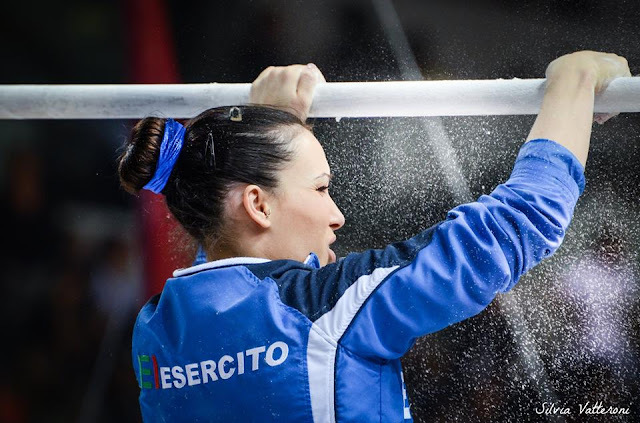 Member of the last Spanish World team finalist in women's artistic gymnastics. Moreno has only 1,198 followers on Instagram and 965 followers on Twitter. Heck she deserves more than that. She blossomed into an absolutely gorgeous woman and often writes positive and uplifting captions. She also shares lots of gymnastics content. Make sure to follow her. British gymnast Ellie Downie is training a new difficult tumbling pass. The 18 year old gymnast is training a forward double pike. The skill is named after US gymnast Brenna Dowell which she competed at 2015 World championships. It is rated an F.
Ellie does three tumbling passe; double double tuck (H), 1.5 twist (C) to double tucked Arabian (E) and double back pike (D). Downie, who became the first male or female British gymnast to win an all around gold medal at a European championship this year, did not compete at the World championships due to undergoing an ankle surgery last July. The Rio Olympian injured her ankle in March but worked through the injury to compete at the European champions. Beside her all around gold, she won silver on vault and floor, a bronze on the uneven bars. Downie has previously said that she has her eyes set on the upcoming Commonwealth Games which will be held in April 2018. 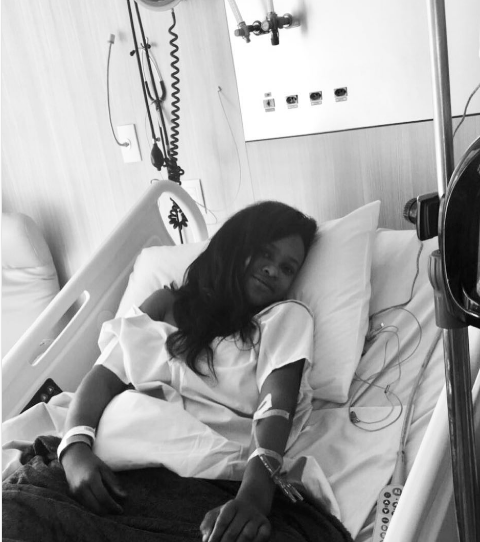 Rebeca Andrade has undergone surgery on her injured right knee. The Brazilian gymnast has torn her ACL, for the second time in the same knee, during training at the World championships which was held in Montreal this month. 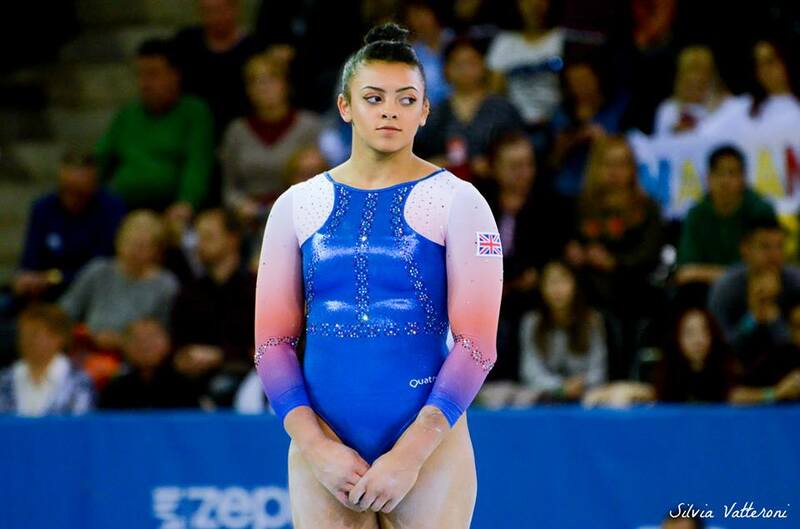 It has not been announced yet how much time is needed for the 18 year old gymnast to recover. However, rehabilitation process generally can take up to six months or more. The 2016 Olympian first tore her ACL in 2015 which took her out of 2015 season. Andrade was one the favorites to shine in Montreal. She was one of several gymnasts who got injured there. Great Britain Catherine Lyons has joined MeToo Campaign where women share their sexual assault experience. The British gymnast, who is best known for winning the gold medal on floor exercise at 2014 Junior European championships, tweeted the hashtage MeToo without giving details. Lyons becomes the third gymnast who took part in the campaign after Olympic gold medalists Mckayla Maroney of USA and Tatiana Gutsu of Soviet Union. Catherine turned senior in 2016. Despite being a promising gymnast, she dealt with lots of injuries which hindered her career. Her last competition was in 2015. 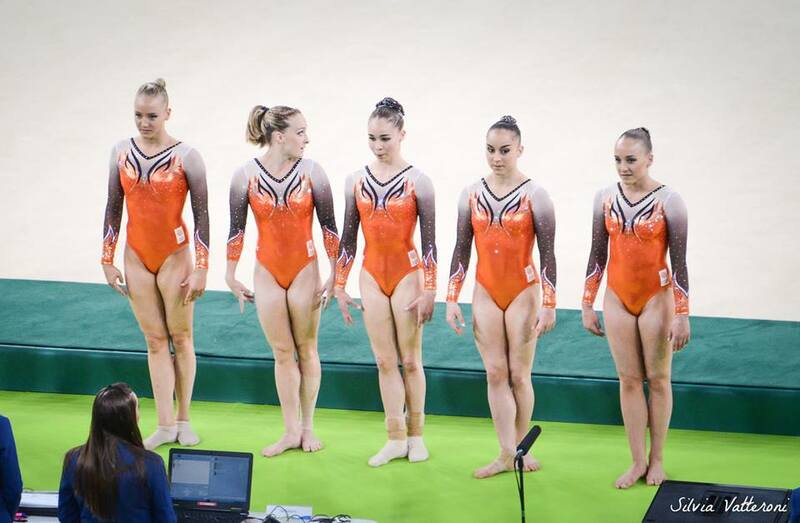 Australia has named three gymnasts to its World championships team. These are Georgia Godwin, Rianna Mizzen and Talia Folino. Georgia Godwin, 20, is the only gymnast on the team to have previous World championship experience, as she competed in Glasgow in 2015. There, she was forty-ninth in the all around and thirty-sixth on floor in qualifications. In 2017, she competed internationally at the Melbourne World Cup, where she won a silver medal on floor with a score of 12.800. Rianna Mizzen, 18, competed at the Rio Test Event in the spring of 2016, and finished twenty-seventh in the all around and twentieth on the uneven bars. 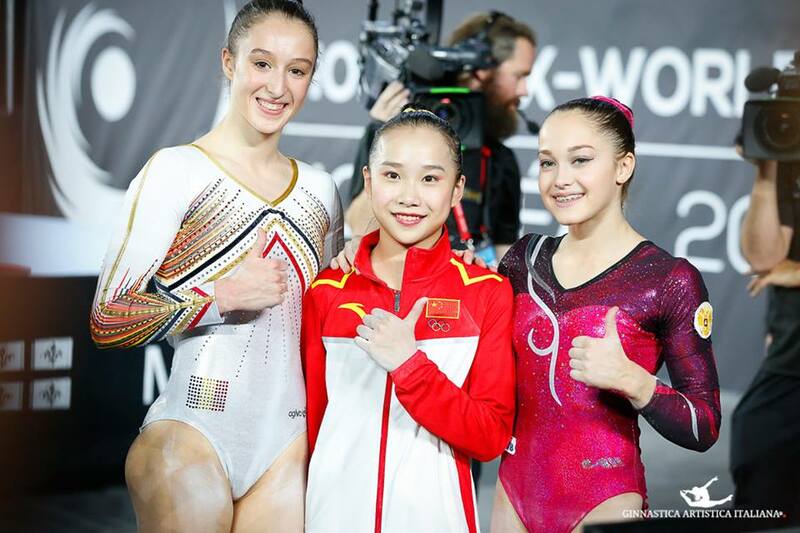 In 2017, she competed at three different World Cups on the uneven bars. She won a silver medal in Baku with a 13.600, a bronze medal in Melbourne with a 13.433 and was fifth in Doha with a 12.966. Talia Folino, 16, is a first-year senior, and a hot name right now, because of her outstanding junior career and her significant achievements this year. Folino was the junior national all around title three times, in 2013, 2014 and 2016. 2014 was her best year, as she won gold medals also on all apparatus finals. Folino made her senior international debut in 2017 at the Gymnix Challenge in Canada. There, she won gold in the all around, and bronze on vault and beam. Georgia-Rose Brown was also included in the nominative roster, but was not named to the official team. Australia’s best gymnast this year, Emily Little, suffered a severe neck injury a few months ago, which put an end to her 2017 season. Spain is the latest country to announce its World championships team. The four gymnasts who will represent Spain in Montreal are Olympian Ana Perez and World championships participants Claudia Colom, Nora Fernandez and Cintia Rodriguez Rodriguez. This is a very experienced team for Spain. All gymnasts have competed at at least one World championships in the past, and two of them have Olympic-related experience. Ana Perez, 20, is the most accomplished gymnast on the team. She competed at the Olympics in Rio last summer, where she finished thirty-sixth in the all around in qualifications. Perez competed at two World championships in the past, in 2014 and 2015, and at three European championships (2014, 2015 and 2016). Perez was fourth in the all around at the 2017 London World Cup and third on balance beam at the Cottbus World Cup in 2015. 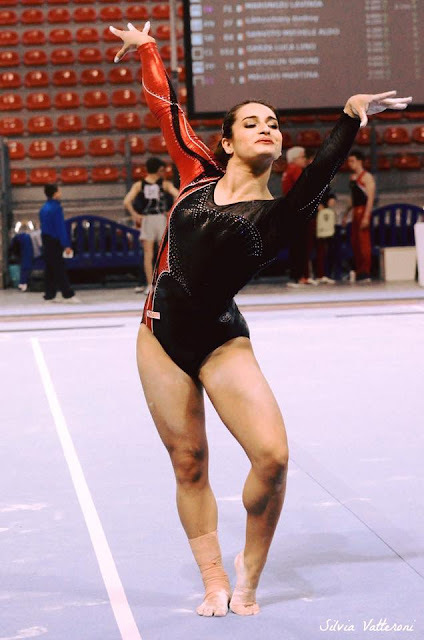 Claudia Colom, 19, is the other Spanish gymnast on the team with Olympic-related experience, as she competed at the Rio Test Event in the spring of 2016, along with Ana Perez. Perez qualified to the Olympics finishing eighteenth in the all around, while Colom finished twenty-eighth. Colom also competed at two World championships (2014 and 2015) and at two European championships (2014 and 2016). She recently competed at the Szombathely World Challenge Cup, where she finished seventh on the uneven bars. Cintia Rodriguez Rodriguez, 23, competed at three World championships, in 2010 as a first year senior and in 2013 and 2014. She also competed at two European championships, in 2014 and 2016. Rodriguez competed at the 2017 Szombathely World Challenge Cup along with Claudia Colom. She qualified for the floor, beam and bars final, finishing sixth, seventh and eighth respectively. Finally, Nora Fernandez, 18, is the youngest member of the Spanish team. She competed at the World championships in Glasgow in 2015 as a first-year senior, as well as at the European championships in 2015 and 2016. She recently competed at the Paris World Cup, where she was eleventh on the uneven bars. Great Britain has announced the official team that will compete in Montreal in October. The four gymnasts are Olympians Amy Tinkler and Claudia Fragapane, and newcomers Alice Kinsella and Georgia-Mae Fenton. The British team is the perfect combination of experienced gymnasts and new faces. Amy Tinkler, 17, and Claudia Fragapane, 19, bring to the team tons of experience and international medals. Tinkler is the 2016 Olympic bronze medallist on floor, while Fragapane is the 2015 European silver medallist on floor and a four-time Commonwealth Games gold medallist in 2014. Both gymnasts were members of the 2015 British team, which won an historic bronze medal at the World championships in Glasgow. With the Downie sisters out with injury, two spots on the British team were open for less experienced gymnasts to take advantage of. 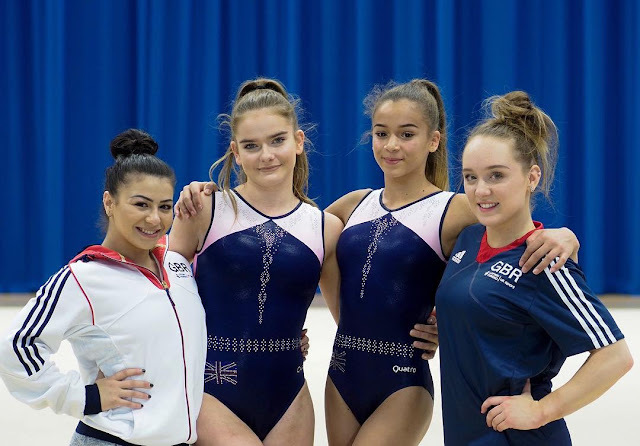 To bring Alice Kinsella and Georgia-Mae Fenton is great experience for them and a big investment for the future of British gymnastics. Alice Kinsella is the 2017 British silver medallist in the all around. In 2016, as a junior, she competed at the European championships, where she won silver on beam, on floor and with the team. Georgia-Mae Fenton is a 2017 World Challenge Cup beam silver medallist, as well as the 2017 British bars silver medallist. Italy's most successful gymnast Vanessa Ferrari has been chosen to represent her country's team at the upcoming World championships which will be held next month in Montreal, Canada. This will be the seventh time for Ferrari to compete at Worlds. She has a total of 5 World championships medals - all around gold and uneven bars and floor exercise bronze in 2006, all around bronze in 2007 and floor exercise silver in 2013. Montreal will be Ferrari's first major international competition since the Rio Olympic Games. The three time Olympian had dealt with a tendon injury which required surgery after Rio. Last month, she announced that she was no longer seeking a place on the Montreal team explaining that she had an injury relapse. She stated that Worlds was never the goal but rather the Olympics and there is no need to rush. Desiree Carofiglio, first year senior Sara Berardinelli and Rio Olympian Lara Mori will compete along side Ferrari in Montreal. Rising star Martina Maggio ended her preparation for Montreal last month following a knee injury. Popular Italian gymnast Carlotta Ferlito was excluded from Italy's Serie due to bureaucratic issues concerning her registration to the competition ending her chances of making the Worlds team. While two time Olympian Erika Fasana, who only competed on bars at Italian Nationals, has not regained her former level yet. Italy’s vault specialist Arianna Rocca, 21, has announced on Instagram her retirement from the sport of gymnastics. Rocca wrote: ‘Let’s say that this was the ending I have been dreaming of for a long time. I could not hope for a better team and for teammates better than you, as despite everything and everyone, we always managed to go beyond impossible. Today I am ending my gymnastics career to turn over a new leaf and to work on other projects. I deeply thank my parents, who have always financially supported me, and who were always with me at every competition and in everyday life; my coaches, who adopted me when I was ten and helped me through a new reality full of projects; Paolo and Tiziana, who have made me grow particularly during these last months from January to now in Milan; my club, which has always supported me in all my choices, and throughout these years has always given me and my teammates everything we needed; my teammates, who have grown together with me and never left me; my girlfriends, who were with me every step along the way; my best friend, who I love dearly for everything she does for me; all my ‘non-teammates’ from other clubs, who always cheered for me at competitions, despite being ‘rivals’; all my physiotherapists, who have always worked hard to make me stay healthy; my psychologist Stefania, for all the work she has done and is doing; and all the people who know me and have always supported me throughout these years, to all of them, thank you from the bottom of my heart’. Arianna Rocca, who competed for the Italian club Forza e Virtù 1892, was a vault specialist. She won three national vault titles (2012, 2013 and 2014), one silver medal in 2016, and two bronze medals, one in 2011 and one a few months ago at the Assoluti in Perugia. She also owns two silver medals on balance beam from the Assoluti, in 2013 and 2014. Rocca also won two silver medals on vault at the Jesolo Trophy, in 2013 and in 2015, both times behind U.S. Simone Biles. 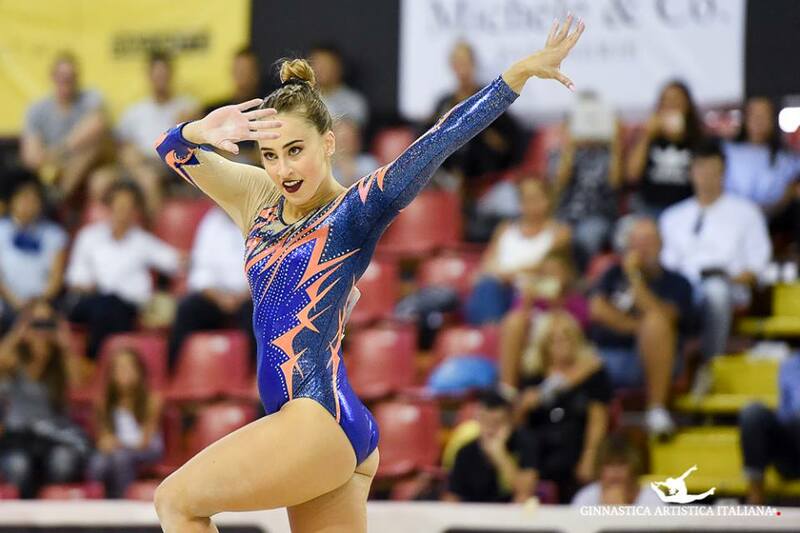 Two days ago, Italy’s Olympian Carlotta Ferlito announced on Instagram that, despite being competition ready, she is not allowed to compete at the Eboli Serie A meet next weekend, because of bureaucratic issues concerning her registration to the competition. The meet is particularly important, because it will most likely determine Italy’s official 2017 World championships team. In the absence of an official statement, we can only hypothesise what happened. The background is quite simple. In order to compete in the Serie A, a gymnast needs to be part of a club team. Ferlito’s current club, the Centro Federale dell’Esercito (CFE), however, does not have one. Ferlito was then temporarily added to her former club, the GAL Lissone, to allow her to compete in the Serie A. Everything seemed sorted, until news emerged this week, that Ferlito’s permission to compete was rescinded. No one knows exactly why. There could be a very simple explanation, for example a missed deadline or some obscure rule according to which a gymnast cannot be named to a club team half the way through the competition season. But the absence of an official statement has sparked controversy and rumours among Ferlito’s fans. Ferlito’s fans started spreading the rumour, fueled by Ferlito herself, of a conspiracy to keep her out of the World championships team. One fan wrote on Twitter, for example, that ‘they like to win easily’. To whom Ferlito replied: ‘You’ve understood everything’. And another: ‘I’d say that it’s because he [Enrico Casella] was worried he had to choose you [for the World championships] over another gymnast, who I will not name because it annoys me too much’. On Facebook, other fans blamed national team coordinator Enrico Casella for doing nothing about it. 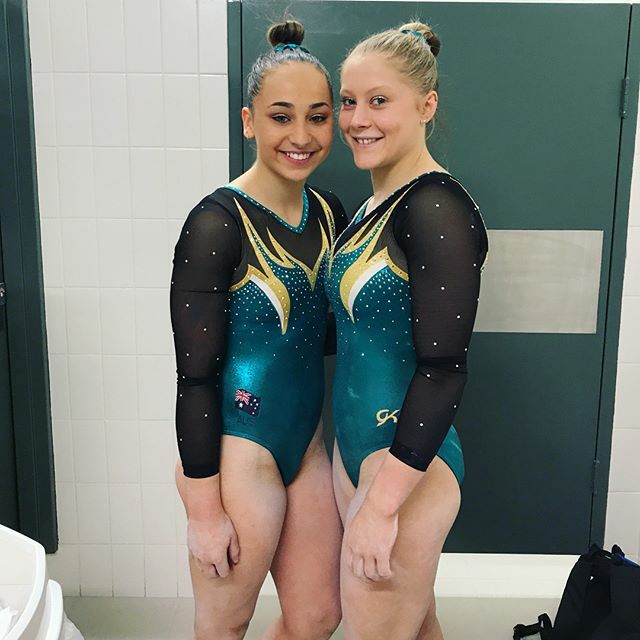 Casella, some fans said, should have intervened to allow Ferlito to compete as an individual, in order to test her routines for the World championships. It is fair to say, however, that the Serie A is a club competition independent of the national team, and had Casella put pressure on the system to have Ferlito compete, he could have been accused of favouritism or abuse of power. Overall, as it is often the case, there is a lot of drama and social media fury surrounding Carlotta Ferlito. 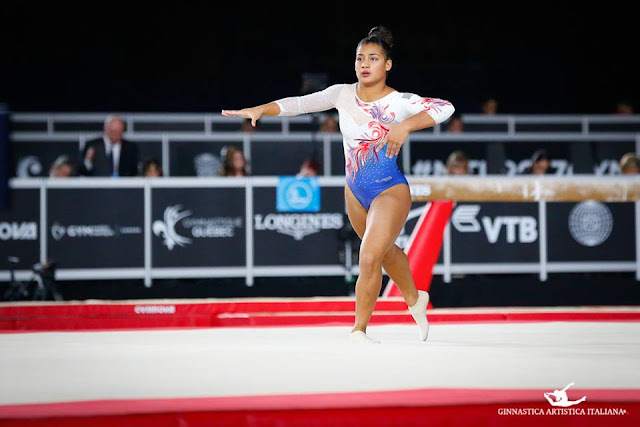 The bottom line, however, is that Ferlito will not compete in Eboli this weekend, and her chances to make the World championships team are very slim. Her first competition of the year, the Assoluti earlier this month, did not go well, and without further competitive experience this season, it is likely that her season ends here. The Netherlands has announced an incredibly talented team for the upcoming World championships. The four women that will compete in Montreal in October are Olympic champion Sanne Wevers, Olympians Lieke Wevers and Eythora Thorsdottir, and Tisha Volleman. At the recent Dutch International the four gymnasts did not look the most polished selves, but once again, no one does this year, and the World championships are still three weeks away, so they have plenty of time to polish their execution. Sanne Wevers, 25, needs no introduction. She is the 2016 Olympic champion on balance beam, as well as the 2015 World silver medallist also on beam. She won a bronze medal on the uneven bars at the European championships in 2015, and a silver medal on beam at the 2017 Melbourne World Cup, which was her first competition since the Rio Olympics. She also won gold on beam at the 2016 Rio Test Event. Lieke Wevers, 25, is Sanne’s twin sister. Like her sister, she competed at the 2016 Rio Olympics, where she finished twentieth in the all around final. She also competed at the 2015 World championships, where she helped the Dutch team qualify to the Olympic Games and finished eighth on floor exercise. Wevers won gold on beam at the 2015 European Games and bronze on beam at the 2016 Rio Test Event. Wevers became famous in 2015 for her lovely choreographed floor routine to Ludovico Einaudi’s 'Nuvole Bianche'. Eythora Thorsdottir, 19, is also known for her beautifully choreographed floor routines, in which gymnastics meets art. She competed at the 2016 Rio Games, where she finished ninth in the all around final, and at the 2015 World championships, where she qualified to the beam final and finished eighth. Thorsdottir also competed at the 2017 European championships, where she won a silver medal on beam and a bronze medal on floor. Tisha Volleman, 18, helped the Netherlands qualify for the Rio Olympics at the 2015 World championships. In 2017 she competed at both the American Cup and the London World Cup, and finished seventh at both competitions. Gymnastics community went crazy over Tabea Alt's Zuchold half, which is expected to be named after her at 2017 Worlds. At the same exact routine, she performed a brand new dismount but it might not bear her name. The German gymnast performed a clear straddle circle with salto forward tucked with half turn off bars at a competition where the upcoming German Worlds team got selected. A clear straddle circle with salto forward tucked is rated a C, so the the skill with a half turn would either get a C or a D.
It is worth mentioning that the *clear under swing version of the dismount is rated a C.
*Clear under swing with salto forward tucked or piked with ½ turn. Since the clear under swing with salto forward tucked/piked without half turn is considered to be the same skill as the one with half turn, Tabea's dismount will be added to the CoP bearing no name. Not to mention that the clear straddle circle with salto forward tucked is also the same skill as the under swing ones under the CoP. Alt used to perform a D rated double layout off bars. Unlike the previous CoP, competing a D or more rated dismount is no longer a requirement in today's CoP. The German gymnast was selected to represent her country at the upcoming Worlds which will be held in Montreal Canada between October 2 and 8. Tabea Alt has debuted a bars transition that is not yet in the CoP during the competition where the upcoming German Worlds team got selected. The German gymnast competed a Zuchold with half turn. A Zuchold is an underswing backward - inverted pike swing - on high bar, dislocate with flight to handstand on low bar. It is rated a D and is named after Eastern German gymnast Erika Zuchold who competed at the European, World, and Olympic level from the mid-1960s to early 1970s. She is five time Olympic and World medalist, and seven time European medalist. Alt was selected to represent Germany at the World championships which will be held in Montreal, Canada between October 2 and 8. If she successfully competed the Zuchold half at the competition, it will be added to the CoP bearing her name. Senior gymnasts need to submit and compete their original skills at either Worlds or Olympics to have them named after them, while junior gymnasts can submit theirs at the Youth Olympic Games. Australian gymnast Olivia Vivian submitted the skill at the 2014 World championships but she did not compete it. The skill received a C rating. Lauren Hopkins, founder of Gymternet blog, said that it received a C rating since Olivia failed to finish it close to a handstand. Hence, Alt has to end it with a clear handstand to get a higher rating (D or E) or else she will be in the same situation as Olivia. Alt turned senior in 2016. She was part of the 2016 German Olympic team.